Launched in 2002 through state funding and grants from the Robert Wood Foundation, the Nurse Practice Act expands training and educational opportunities for aspiring nurses in South Dakota. According to the state’s Board of Nursing, the past five years have seen the introduction of four new training programs for registered nurses and a steady increase in the field’s employment rate. With projected double-digit occupational increases, nursing is a dynamic profession with multiple paths to career success in South Dakota. Interested individuals can use this guide to learn about licensure requirements, review occupational outlooks for the field, and compare top nursing schools in South Dakota. 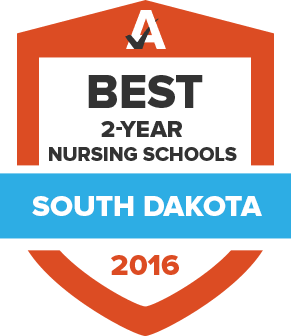 In Fall 2014, nursing schools in South Dakota prepared 2,166 undergraduate and graduate students for the profession, according to the American Association of Colleges of Nursing. An additional 154 students earned degrees to become APRNs. Those looking to following suit can use the search tool below to find, filter, and compare nursing schools in South Dakota. All nurses must hold a valid and active license to legally work in the state. The practice of nursing is governed by the South Dakota Board of Nursing, which has established guidelines and requirements for registered nurses and APRNs. Learn more about the steps required for first-time applicants seeking a registered nursing license in South Dakota. Nursing licenses in South Dakota are valid for two years. Although the state does not have continuing education requirements, a minimum practice requirement is needed to renew a nursing license. After receiving a renewal postcard, licensees will need to complete a form, which requires their social security number, RN license number, and employment verification. Employment verification ensures applicants have met the minimum practice requirements of 140 hours of work in any 12-month period or at least 480 hours in the preceding six years. The $90 renewal fee is due when the application is submitted. The South Dakota State Board of Nursing maintains additional licensing requirements for individuals in advanced practice registered nursing roles. Whether working as a certified nurse midwife, certified nurse practitioner, clinical nurse specialist, or certified registered nurse anesthetist, these professionals must fulfill RN licensing requirements and a few additional steps. Below is a list of the eligibility and licensing mandates for all advanced practice nurses in South Dakota. Visit the South Dakota Board of Nursing for more information on advanced practice nursing and licensure procedures in South Dakota. Elevating the practice of nursing and producing additional qualified registered nurses is a critical goal for the State Board of Nursing and groups such as the American Association of Colleges of Nursing. The AACN reports the state has 67 medically underserved regions and 83 areas facing a health professional shortage. Because of a continually increasing demand, opportunities for nurses are projected to remain strong well into the future. Learn more about the occupational outlook and earning potential of South Dakota’s nursing industry below. The SDCNW is dedicated to recruitment, development and advancement of nurses in in South Dakota. Through local partnerships, continuing education and nursing leadership programs, the center helps nurses better meet health care needs in the state. This professional organization is a member of the American Nurses Association and serves to centralize the voices of its members through legislative action. It also provides access to scholarships, conferences, networking events, and professional development opportunities. The South Dakota Organization of Nurse Executives is a membership-based organization for nurses working in health care management, administration and strategic performance. Through scholarships, professional networking events and continuing education programs, SDONE endeavors to advance the work of nursing administrators in the state. Serving as the regulatory body that oversees the practice of nursing in the state, the Board of Nursing establishes licensing requirements, manages licensing and renewal processes, and handles disciplinary issues for practicing nurses in South Dakota. This association is a state chapter of the National Student Nurses Association. It is a pre-professional association that supports student nurses via scholarship programs, conference opportunities, leadership development, and mentoring. The South Dakota Nursing Action Coalition is the state-level affiliate of the national Future of Nursing Campaign for Action, a research and advocacy group funded by the Robert Wood Johnson Foundation and the AARP.